It's fashionable for elite athletes to publish their blood passports so here's mine over the last year or so. I know it looks like the profile of someone with an EPO addiction but it’s actually just sorting an iron deficiency issue and treating a thyroid condition optimally. Over the years I’ve struggled with anaemia and iron deficiency. 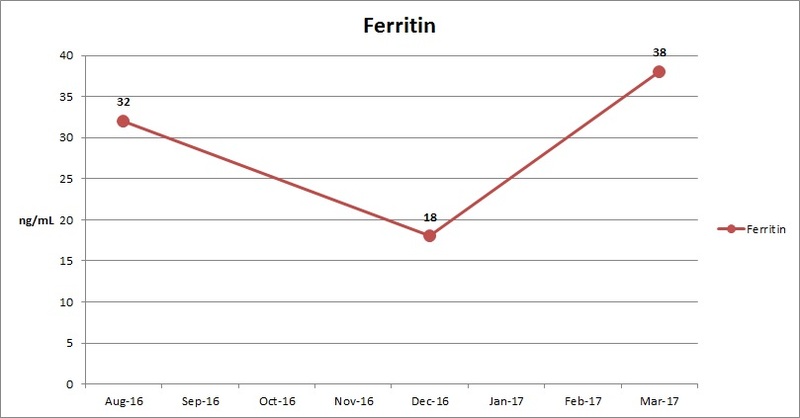 My ferritin was 9 at one stage. That was not fun, I wasn't taking any iron supplements and had just started running. My Haemoglobin would rarely be above 13 and my Haematocrit would be 39-40. I've tried all sorts of mad things over the years. I once tried eating 200-400g of fillet steak every day for two months to see if it would increase my ferritin, it went down. I don't think it's diet related, it seems to be absorption from the stomach. I eat little or no red meat at the moment now and its never been better. I can't identify the one factor that has improved my blood parameters but finding a good iron supplement definitely helped. I don't seem to absorb Galfer (305mg ferrous fumarate, 100mg Fe) that well, it on its own only keeps my ferritin at about 20. I added another iron supplement called Feosol Complete (28mg Fe) last year which has haem iron polypeptide (HIP) which is more bioavailable. I've also recently started taking Active Iron which was developed by a Cork company to improve iron absorption. Taking thyroxine has pretty much changed my life. I know what you're thinking that's the stuff that Mo Farah and Galen Rupp get off that evil doper Alberto Salazaar. Well actually some people need it. I had been on it before back in 2013 as my GP thought that my TSH was high enough to warrant it, I started on 25mcg and noticed no difference so I stopped. Then last year I was feeling particularly awful, no go, a bit down and always sleepy so I went to the doctor to get it checked again. This time I had a Thyroid antibody test which showed that I had elevated Anti-Thyroid Peroxidase Antibodies 39.3 IU/mL when the reference range is 0 - 5.61 IU/mL. This combined with a high TSH confirms an autoimmune thyroid condition which warrants treatment with thyroxine. I initially started on 50mcg which increased to 150mcg per day. In a couple of months I started to feel way better, better mood, more general energy, less daytime sleepiness and in general happier. My running also improved. Do I think it could be used as doping? I'm not sure, all it does in my case is put my levels back to normal. General life is not fun without it, I would take it if I wasn't running. Any way here's my list of stuff and the blood test graphs.